After centuries of relying on rice and noodles to feed its hungry masses, China is now turning to a familiar British staple to meet the needs of its 1.3bn-strong population – the humble potato. Facing more frequent droughts, falling water tables and widespread soil erosion, China’s government has designated the potato as a "strategic" crop in the latest Five-Year Plan and is investing millions of pounds in researching new varieties. This spring Beijing hosted its second International Potato Expo, attracting growers from around the world, including Britain, hoping to cash in on China’s new-found love for the spud. "What we are seeking is market access for British seed potatoes in China," said Allan Stevenson, chair of the British industry’s Potato Council, speaking in Beijing. "Britain has the most technologically advanced potato seed industry in the world and we can deliver substantial benefits to the Chinese." The potato is proving attractive both to Chinese consumers, who eat an increasingly Westernised diet, and to government officials charged with maintaining China’s target of being 95pc self-sufficient in food. With 20pc of the world’s population and just 7pc of its arable land China is also hoping that the potato – which produces three or four times more calories per acre than rice or corn – can alleviate poverty by boosting farmers’ outputs and incomes. Last May China’s government announced that the potato – which it counts as a "grain" – would play a key role in meeting its target to increasing grains output by 10pc by the end of the decade. Although China is already the world’s largest grower of potatoes, its crops fall well short of demand as China’s new middle classes gorge themselves on rising quantities of French-fries and crisps – with fast-food giants such as McDonalds and KFC opening several hundred new outlets between them every year. "More and more Chinese are studying and travelling abroad, and as a result buy more and more imported foods," said Peter Bloxham, chairman of PFB Associates, which imports Scotland’s Mackie’s-brand crisps into China. "They have got used to having crisps with their beer, for example, and are also prepared to pay for foreign brands." China does not allow imports of potatoes for consumption, but an agreement signed six years ago did allow British growers to export cherry tomato-sized "mini" tubers to China for growing on into seed. However, British growers have so far been deterred by the risk of having their most valuable varieties – which can increase yields by 30pc overnight – copied and cloned by unscrupulous farmers. "The protocol was signed six years ago but not a single producer has taken advantage of it because of the inability to protect their varieties," said Mr Stevenson of the Potato Council. "It would be like giving China the master-tape of a Hollywood movie on the day of its release." Negotiations are now under way to allow the export of full-grown seed potatoes to China, enabling seed growers to make profits and offset the risk of intellectual property theft. 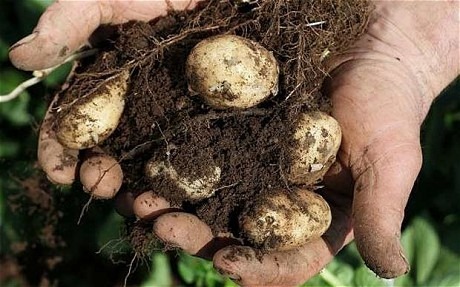 After what it described as a "decade of false dawns", the Council now hopes a deal to export potato seed to China could be signed as early as May 2012, which, as well as allowing British potato seed, could also open the door to a package of spin-offs in science, agronomy and training. "This market has been simmering for a while now," said Graeme Prentice, business development manager for Irish Potato Marketing, "but in the next five years, it is really going to take off."